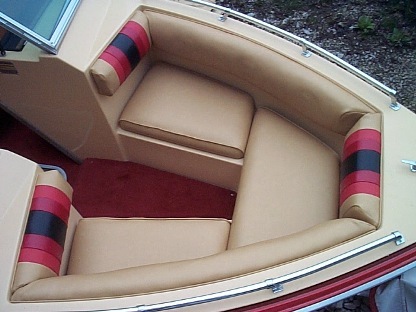 Seats and other interior componenets can be completely fabricated from scratch using 100% sealed plywood or fiberglass resin coated marine plywood and premium vinyls. I can use your existing seat frames (if not rotted) and foam cushions (if not affected by mold) to save expense. 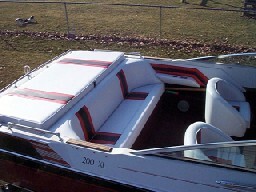 Seat panels can utilize different colored panels and cord piping trim (red in this example photo). All cord piping is made by hand using premium marine vinyls and foam core (unless specified otherwise by customer). New layback seat in the down position. I may be able to use your old hinges or hardware to save expense if you are replacing your seats with the exact same style. The top photo clearly shows the old seat on the left and what a difference the new seat on the right makes to improve the looks of the interior. 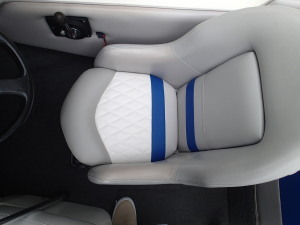 The bottom photo shows both new seats installed in this SRV220 Searay. 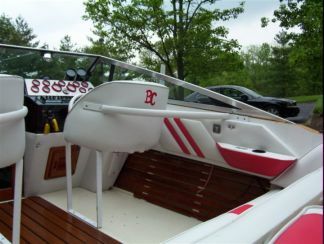 The red piping trim adds an element of current style and makes the whole boat look great! 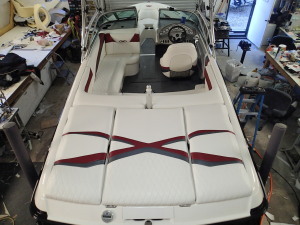 This customer allowed some artistic license to transform this Mastercraft into a one-of-a-kind masterpiece. The latest available carbon fibers and other higher end vinyls were used in the design and fabrication of the skins. Holly's meticulas expert craftsmanship is revealed in every upholstered component. Well done Holly! Look for this boat down at Dale Hollow Lake. It will be hard to miss. 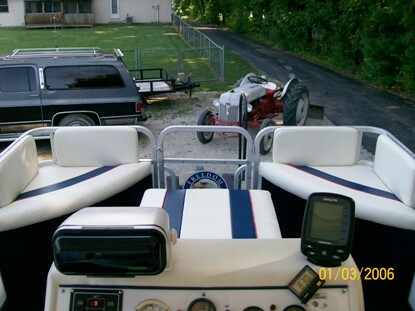 Here is a very clean and well maintained 32 foot, twin big block go fast from the late nineties. This was truly a team effort including the boat owner who replaced the substrates. Embroidery work by "Etched in Stone", Whiteland, Indiana. 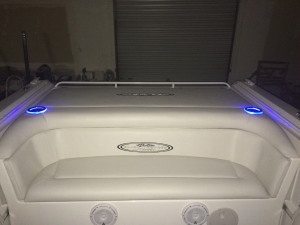 Custom fabricated backrest cap now includes blue LED lighted cup holders. What a nice touch! 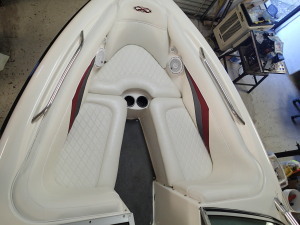 Midship quality vinyls, foam replacement upgrade to three inch high density in the engine cover and two inch in the seat cushion. No nonsense, rich, luxurious, eye candy! 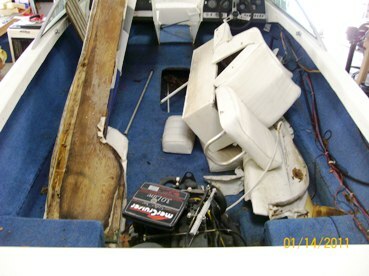 Any upholsterer will agree that this may not look complex, but, is arguably one of the most difficult pieces to restore in any boat. 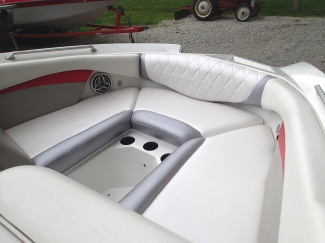 Aft seat cushions also recovered with the same premium materials. Credit for this gorgeous work goes to Chris who has worked extremely hard over the last year to achieve this level. One for the hall of fame. Our customer was very pleased! Here is a creation from our newest staff member Holly, who has a degree from Indiana University in Fashion Design. She also gained real life experience in Virginia Beach working on high end boats. I am truly honored to have her here at the shop! Her work speaks for itself in these photos. This is just one of many examples of her work. The registration of patterns from one component to another is spot on. High five Holly you hit this one out of the park! Of course, only the highest quality materials were used. A couple steps past the original design of this older ski boat. Very pleasing to the eye! 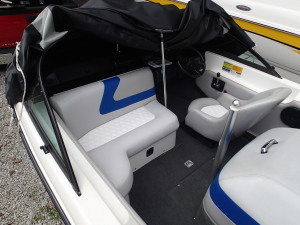 Now all you Tige aficiondos know the 2007 model was not offered with this interior package. Our awesome staff had the privledge to fabricate, from photographs, a replica of the newer interior in this awesome California inspired picklefork ski boat. The end results are stunning! My hats off to the original designer. The patterns and colors are a real attention getter. If your looking for tasteful bling......this is it. One more example of the talent and skill of our staff. 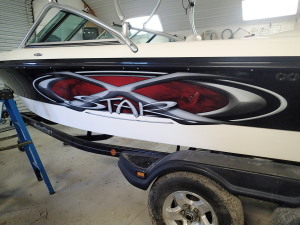 2002 MasterCraft 197 open bow ski boat. This boat arrived clean and very well maintained. 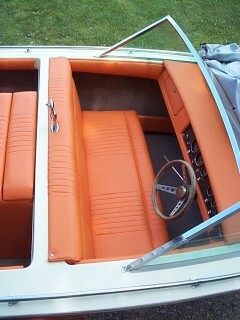 The original interior did have a couple issues from the previous decade of use. Mainly light staining and some cracking of the vinyl. The owner desired to maintain much of the original design intent, but, eliminate some of the seams that were failing and did not serve any purpose other than a visual appearance. This resulted in a more modern and clean look that achieves what the original design team missed. The owner also stepped up the vinyl quality and texture. We think its prefect now! Much credit to Kelly Parish for creating the vinyl skins. You nailed it kelly! And the rest of the boat shop staff for removal, skin refastening, and installation. 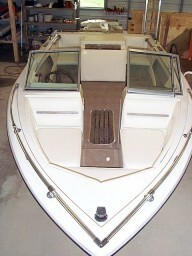 1990 Rinker 180 open bow. One of our 2010 - 2011 winter projects. This particular job marks the first time the shop has completed two identical models simultaneously. 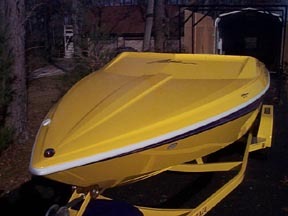 Both boats came originally with the exact same colors and design scheme. 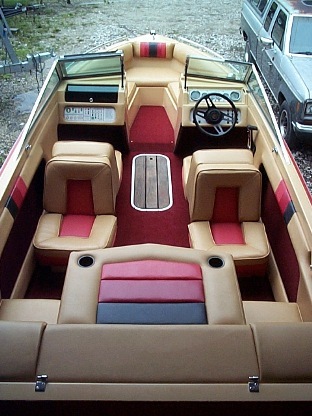 Please note the boat pictured came without many of its factory installed upholstery components. We used the first boat completed as a template to replicate many of the missing pieces. Additionally, we replaced all the pieces pictured with new fabricated components. This boat is literally brand new on the inside. The original design was slightly changed to lighten up the colors. Black was replaced with navy blue and the original navy blue with light blue. All of the new pieces incorporate "sealed" plywood carpentry for the marine environment. All wood is encapsulated with lifetime guaranteed exterior paint providing insurance against future rot. 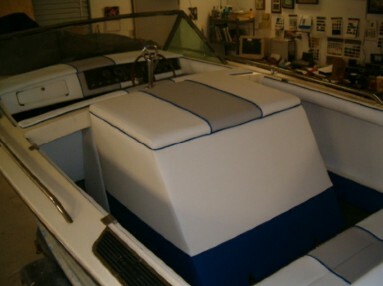 This boat also recieved gellcoat fiberglass rub-out and wax detailing. Put 20 years back on it! Sorry, no pics to save space. Please see the "gellcoat restoration" page for further info. This unique boat was built and named by local business man and patriot Harley Wilson after "Chief Boatswain" Harold B. Estes presently hailing from Hawaii and recently comminssioned "Admrial" in the Texas navy. 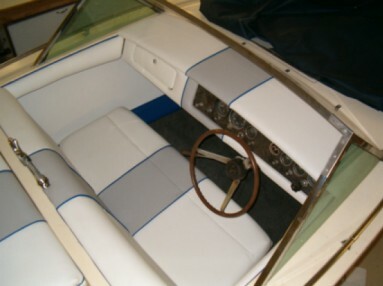 All interior components designed and produced by Indy Covers (except helm seat and engine box). The view of the helm does not adequately depict the size and profile. 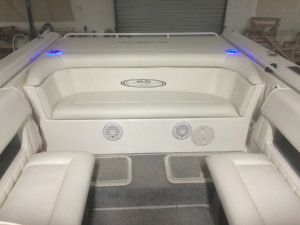 A large compartment housing the 13hp Honda air cooled engine and hydraulics to power the boat is integrated with the gauge cluster, steering and throttle (valve). 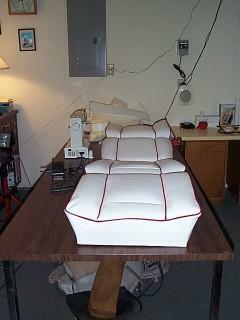 All upholstery has a modern, patriotic, clean look. Red and blue piping. Firm, quality foam. Raised under knees. 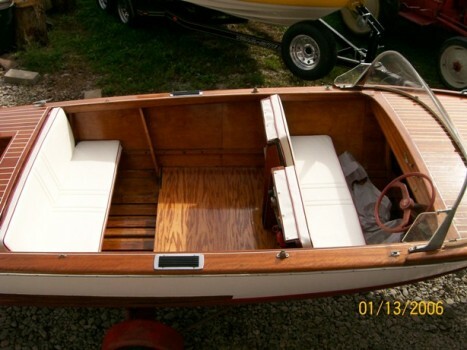 Congratulations to the owner for restoring this boat beyond the designers original intent. 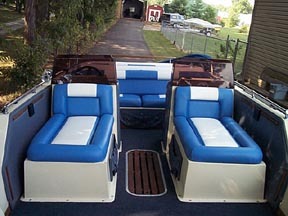 This stock model was manufactured with traditional lay back-to-back seating, engine box, and aft port/starboard seat cushions. 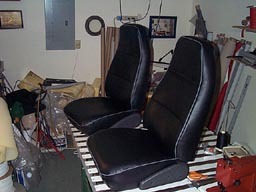 All cockpit upholstery pictured was created from scratch here at Indy Covers. Eric's handiwork all the way! 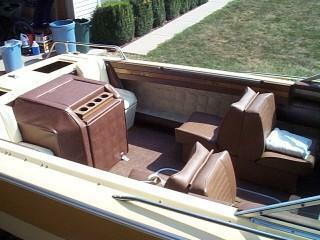 This boat now sports very stylish swivel bucket seats forward and a bench seat with sundeck aft. Clean modern look. Sweet! Custom embroidery by Jim Mitchell. Heres the rest of the story. What you can't see under that new carpet is a brand new floor, 70% stringer replacement, new port engine mount, and new floatation foam. This boat will be enjoyed for decades to come. Thanks for letting us help complete your dream Russ! Take a look at this fine example. 1991 Thundercraft. Clean three color contrast. 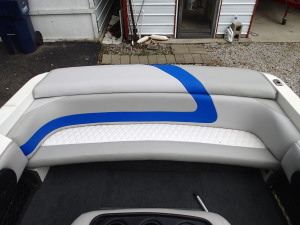 Premium marine vinyls backed with 3/8" foam. Boat was well cared for. Only the wood in the sundeck engine cover had to be replaced. Reused original seat foam to save expense. Custom logo embroidery provided for the top panel of the cockpit bucket seats. Nice touch! Four different premium vinyls and new seat foam for a better ride. 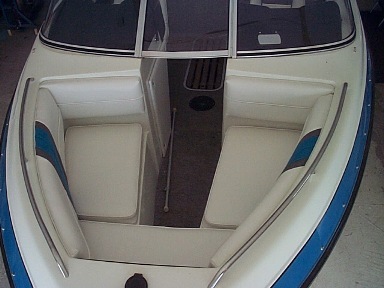 1989 Bayliner Capri 2150. This boat turned out really nice! 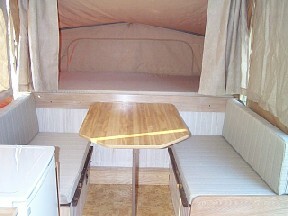 Super deluxe interior for a 22 footer. We kept to the original design elements, but, eliminated the gray and black. 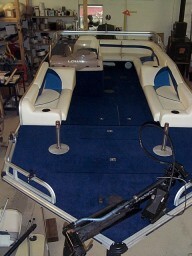 Total marine backed, carpet replacement. Color combination is awesome in my humble opinion! 70% total rebuilt from scratch. The upholstery wood was so rotted we were lucky to get patterns from it. A couple of the interior components were missing. Notice the missing aft facing seat of the starboard layback unit. Also the port aft jump seat and engine cover trim were missing. 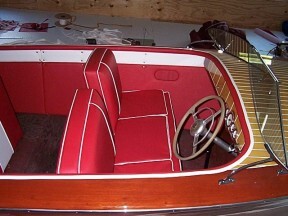 This little runabout recieved a brand new floor as well. See pictures here. 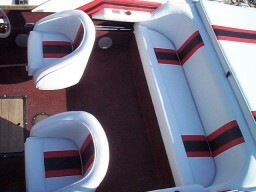 Premium Catamaran Extra marine vinyl. Everyones says pictures do no justice. One detail I can affirm that does not show up in these pictures is the basket weave, 3d look to the red Techno series vinyl. The embroidery really sets it off! Jim at BJ's went the extra step to nearly replicate the basket weave effect. 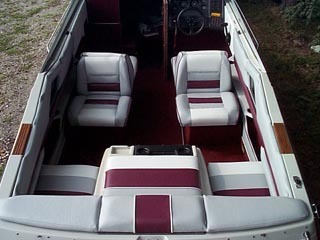 These boats come standard with deluxe multi-colored interiors. This customer works the late shift at his job and doesn't like paying for a whole day at a hotel for just 4 hours of sleep! 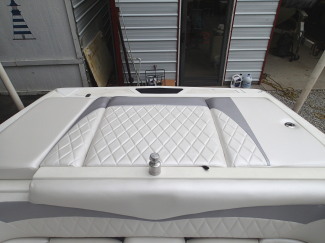 The solution was to create a V-berth cushion under the forward deck. The bed is large, 75" wide by 82.5" long. Enough head room exists allowing you to sit upright on the cushion. I devised a way to retain the bow storage recess and provide support for the V-birth by creating a compartment lid. This lid doubles as the floor for the birth cushion. 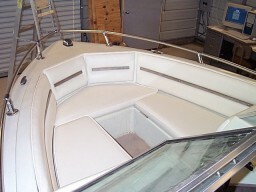 The lid is fiberglass coated marine plywood and hinged to a bulkhead that I also fabricated for the application. Gas shocks make opening and closing the storage compartment a breeze! 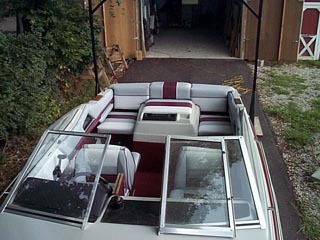 Check out this cool boat on its own page. 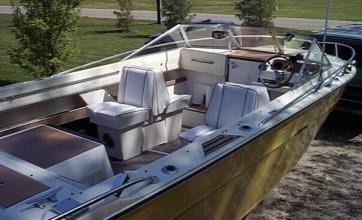 This boat was delivered in route to Key West Florida from the Chicago area in mostly original condition. Covered and stored well over the years as nearly all the wood framing was in pristine condition! Only one of the floor panels needed repair. Some of the original components were altered or missing and the owner requested they be duplicated to retain the original design intent. Burlwood features on the fore, aft decks and the engine cover were replaced. New stainless cup holders were installed in the engine cover bar top. 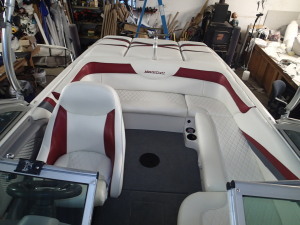 Since this is intended to be a user boat and not a trailer queen the new owner lightened the color scheme a shade from the chocolate brown to a more cooler, camel tan. 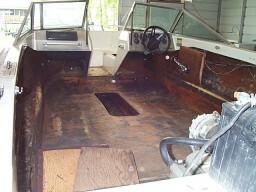 All of the old interior carpet was replaced with new cordinating sand colored premium marine backed carpet. 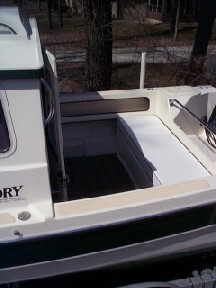 New green tinted wing glass was installed to replace the old, crazed, sun bleached glass the boat originally came with. New black hull stripes were applied. Finally, the boat hull was rubbed out and waxed twice with carauba wax before being sent on its way to Florida. 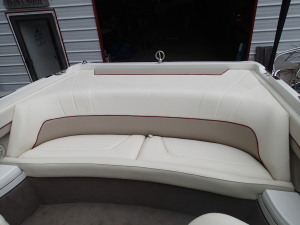 The old interior served well over the years and it was time to renew it with premium grade marine vinyl from Mayer Paetz. Super nice, rich, clean look! All vinyl is backed with premium sheet foam before patterns are cut and sewn. Engine cover recieved extra one inch thick grade A foam. 80% of all interior wood was replaced with marine grade woods and sealed to prevent premature failure. Only stainless hardware is used to replace old worn out screws, bolts, and nuts. This boat was stored outside, uncovered for an extended period of time detstroying the original interior. 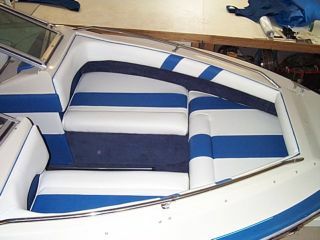 Recovered with premium Nautolex marine vinyl. 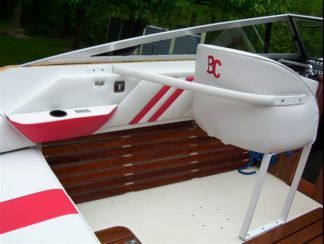 The customer chose a very clean and attractive color scheme for this boat. 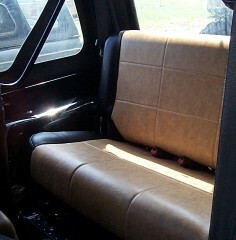 A view of the back seat. Most wood was replaced and sealed for the marine environment. 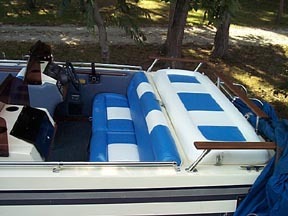 If you were placed on board this boat blind folded you would never know this was a 1989 Bayliner 2755 Ciera. The color scheme matches 2006 model Maxums and SeaRays. 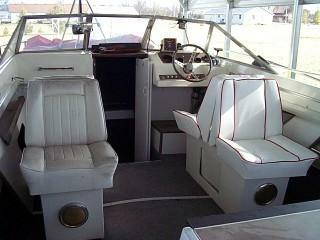 The pictures do no justice to the cockpit and aft deck upholstery. In person the colors look buttery soft. So good you could eat it. 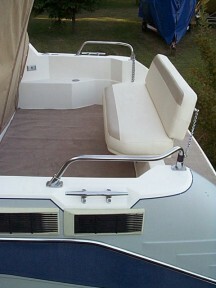 We also built a new bimini top, complete camper enclosure, and snap in/out carpet for this boat. Complete interior refit. 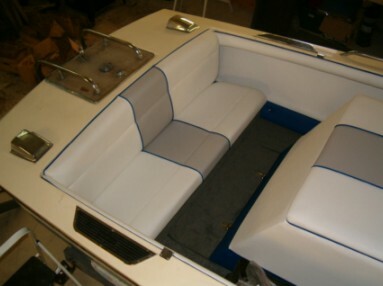 Floor repair, marine carpet replacement, seat and trim framing, vinyl and 70% foam replacement. Catamaran and Islander maine vinyls. Both port and starboard dash survived the weathering intact. Just new sheet foam and vinyl on these components. 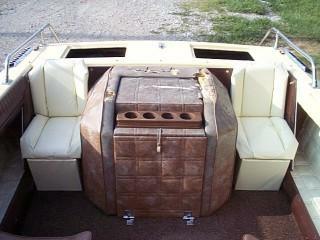 The amount of vinyl in this late eighties boat would cover two new boats today! Approx. 25 yards. Nice factory replacement color scheme. Near perfect color matching for a twenty year old vessel. 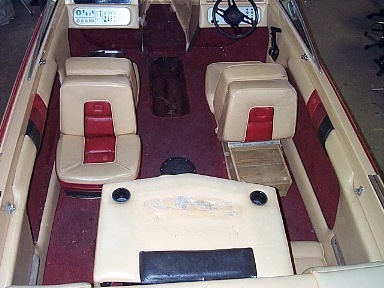 Compare the replaced front seats, back seats and top of the engine cover only to the original bottom of the engine cover. 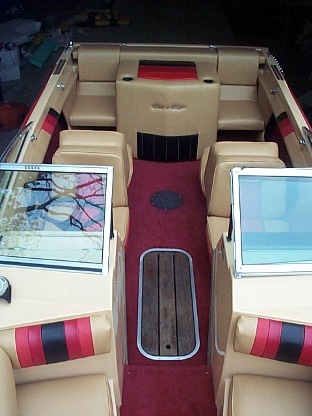 Here is a very nice example, 1988 Searay Seville. 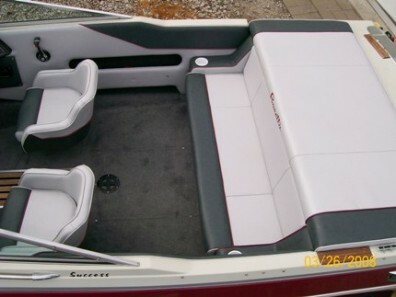 These are solid built boats with alot of vinyl. 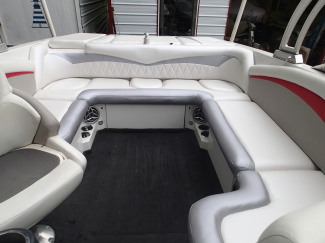 We replaced all of it, including dash components, with "Catamaran Extra" premium marine vinyls. This design is a notch up from the modest factory sport version. Replaced wood where minor damage was found and installed sheet foam for that plush feel. 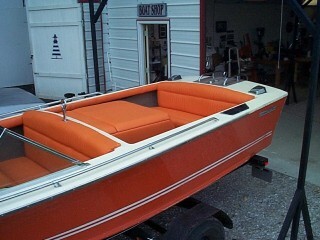 View other pictures of this boats makeover. Pictured here is a mid 80's "MAXUM", 21' LOA, cuddy. The owner gave me artistic license to create the patterns in the upholstery. 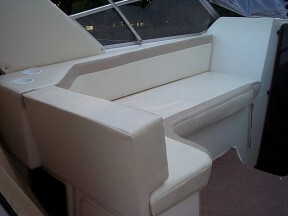 All the upholstery is premium grade marine vinyl using existing foam. Most of the wood was still useable, but, new treated wood was used in some of the trim pieces. 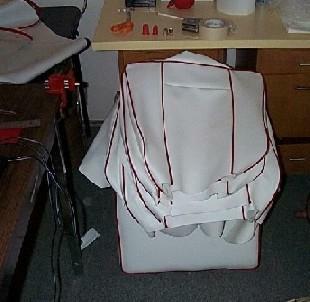 I restored the gellcoat upon completion of the upholstery. 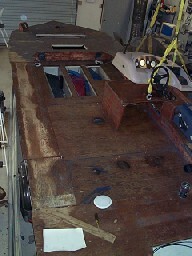 You can check out the finished hull on the "Gellcoat Restoration" page. 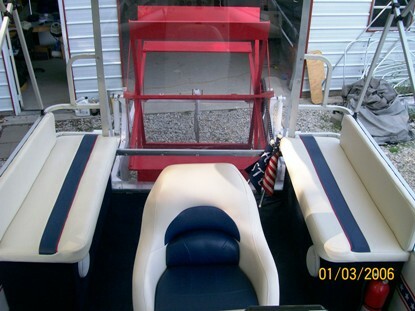 This boat was purchased for $3,500.00. 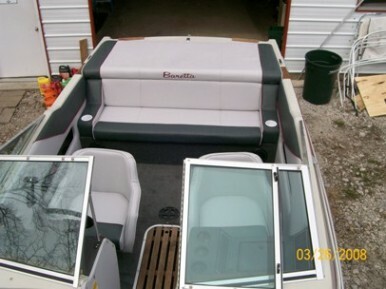 Todays value for this job is $2,800.00 to restore the upholstery and gellcoat bringing the total investment to $6,300.00. 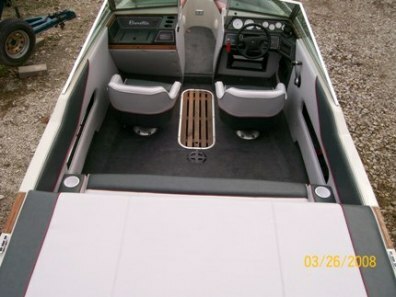 Please compare this boat to the new $35,000.00 equivalent. Money in the bank!!! I'm positive this family is having just as much fun! 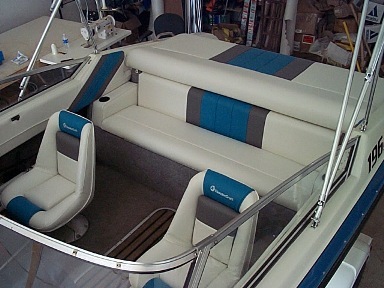 Here is a terrific upholstery refit for a 1991 Harris Floatboat (Float Boat) pontoon. Eric really did a fine job! Original framing was in really good condition. Our customer sealed all wood prior to recovering to further insure another 20 years of long service. 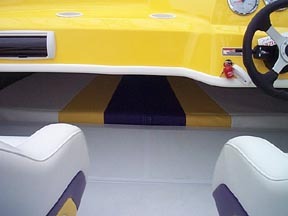 Modern, clean look using the latest high quality and colors available for marine vinyl. 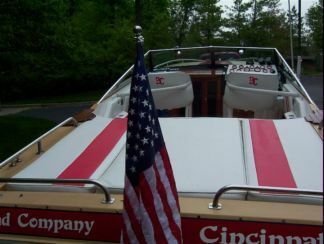 This 1997 Lowe deckboat was freshened up with brand new premium vinyls and backed marine carpet. Back to brand new including new stainless hatch handles. 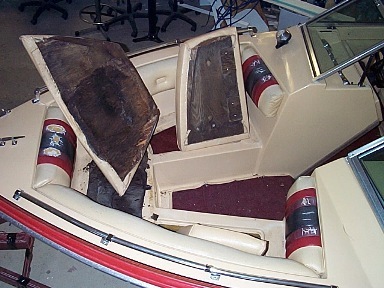 The boat was stored with a leaky cover and the original vinyl suffered the consequences! 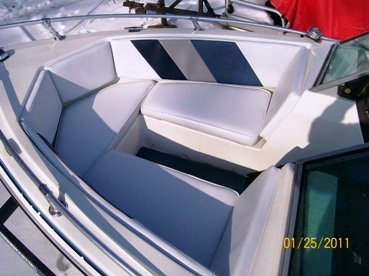 Recovered with Capitano marine vinyl. 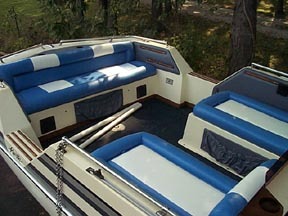 Another view of this deck boats mid lounge seats. These seats hinge open for underneath storage. 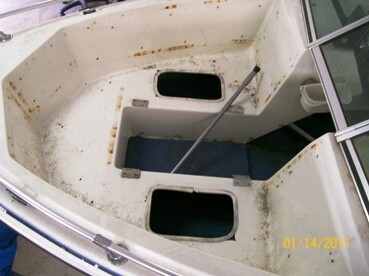 Helm and aft seating. The contrasting white stripes add a sporty look for this otherwise modest runabout. So many cruisers do not have any seating in the aft deck. In my opinion this is a necessary installation. This seat is approx. 7 feet long, 2 feet wide, and 3 inches thick. High density foam for long rides. 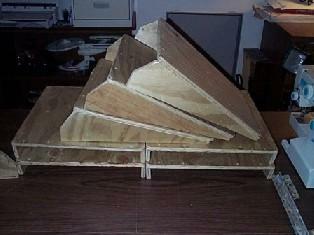 WEST system used on the plywood. 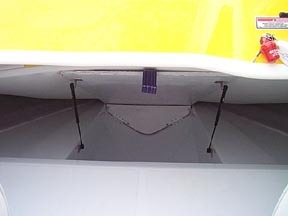 Front skirt for underseat storage. 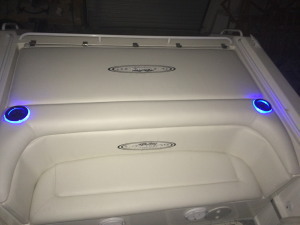 Plan on around $350.00 for something like this installed. All interior components were recreated using the old rotted wood for patterns. As you can see, this boat turned out pretty awesome! 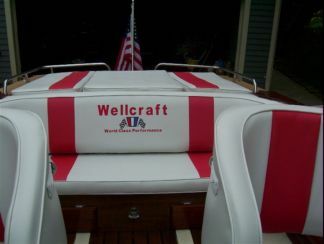 Customer chose the original color scheme for this 1986 model, 200XL "Wellcraft". The original had a much darker grey than the light grey you see in these photos (much cooler to the touch in bright, hot sunlight). I replaced all the seating and sundeck foam with new grade "A" high density foam and you can certainly tell the difference when you sit down! 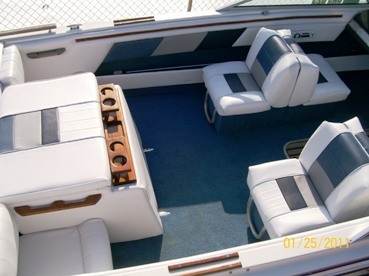 This 1995 Bass Tracker Pro fishing boat turned out great! 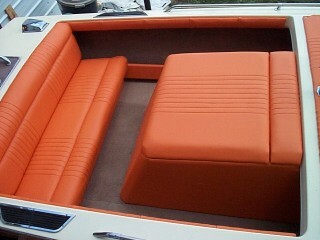 Recoverd the original bench seats to match the larger aftermarket pedestal seats. Includes embroidered "Tracker" logo. 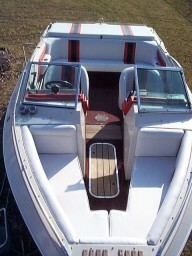 This boat also received new cockpit floor, carpet throughout and a new travel cover. Here is a early Caravelle with a long gone engine cover! Also, notice the trim piece missing from the top of the inside gunwale on the right. New engine cover and side cockpit panel. Again, premium vinyl, and treated plywood. Marine grade varnish is applied to all other woods used. 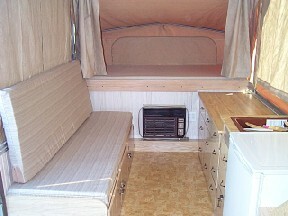 This is the interior of a restored pop-up style camper. All new foam and designer style Sunbrella upholstery fabric. Full length metal zippers for easy cover removal and cleaning. 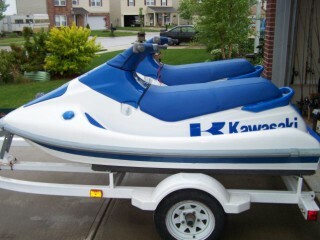 A good customer of mine restored these Kawasaki jet ski 750's and asked me to recover the seats. Super end result for a couple older (1992 and 1993) models! 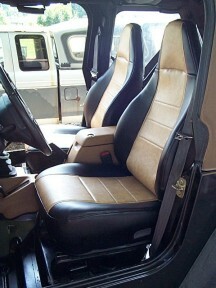 Here is a nice example of custom interior for a 1989 Jeep Wrangler. Desert sand with black trim. Premium vinyl backed with sheet foam. Here is a pair of stock Ford van seats recovered in 1/4" foam backed black marine vinyl and contrasting dark grey vinyl piping.